I love to bake. And I love to share easy to make, gluten and grain free desserts with you. 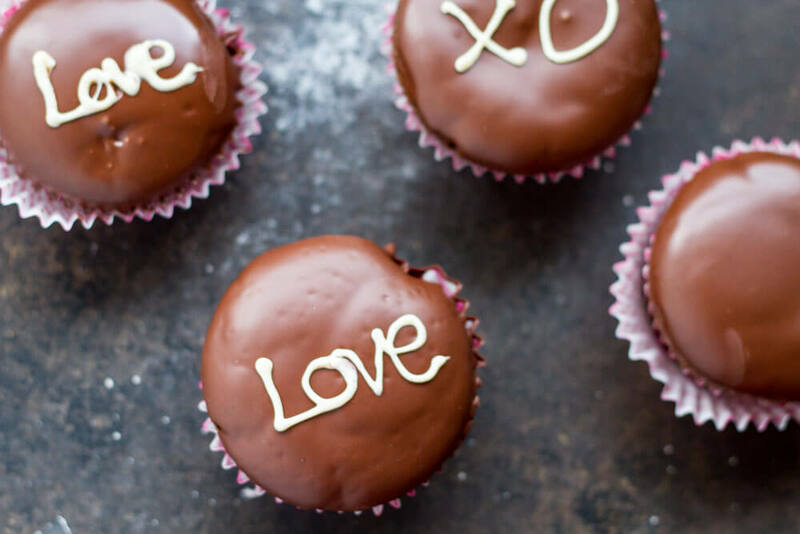 So when I was trying to decide what to share for Valentine’s Day this year, I realized that I did not have a basic chocolate cupcake recipe for you. Everybody loves a good chocolate cupcake, right?? 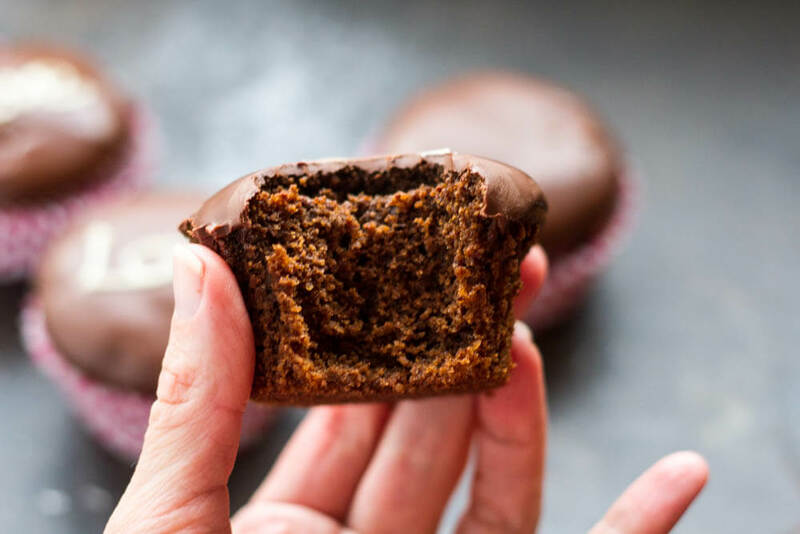 So here it is: the best dang (gluten and grain free) chocolate cupcake recipe that you will ever try. I love blanched almond flour for the base of my baked good. The fine texture is perfect. I don’t like the dry, gritty texture that you find in some gluten free baked goods. (You know what I’m talking about! Yuck!) If I am going to eat a decadent dessert it has to be a good one. I’ve found that adding in a mix of other grain free flours makes for the best texture and consistency. My goal is for people not to realize that they are eating a gluten free treat. You can read more about what grain free flours I like HERE. And if you are feeling adventurous, you can even melt a bit of white chocolate and get out your piping bag. These would be PERFECT for Valentine’s Day! Hope you enjoy! I know we all did! P.S. I’ve had several people try out my chocolate cupcakes, and the best compliment that I got was, “I couldn’t even tell it was gluten free. It tasted just like it came from a cupcake shop.” WIN!! Preheat oven to 350’F. Line muffin tin with muffin liners. Set aside. In a large bowl, sift together almond flour, arrowroot, coconut flour, cacao/cocoa, baking soda, and salt. Whisk to combine. In another bowl, whisk together eggs, fat of choice, maple syrup, and vanilla. Add wet to dry and mix until well incorporated. Divide batter evenly among 12 lined muffin cups and bake for 19-22 minutes. Remove from oven and allow to cool completely. TO MAKE CHOCOLATE GLAZE: Melt chocolate chips and coconut oil in double boiler, stirring often, until glossy and smooth. Remove from heat and allow to cool for 10 minutes. 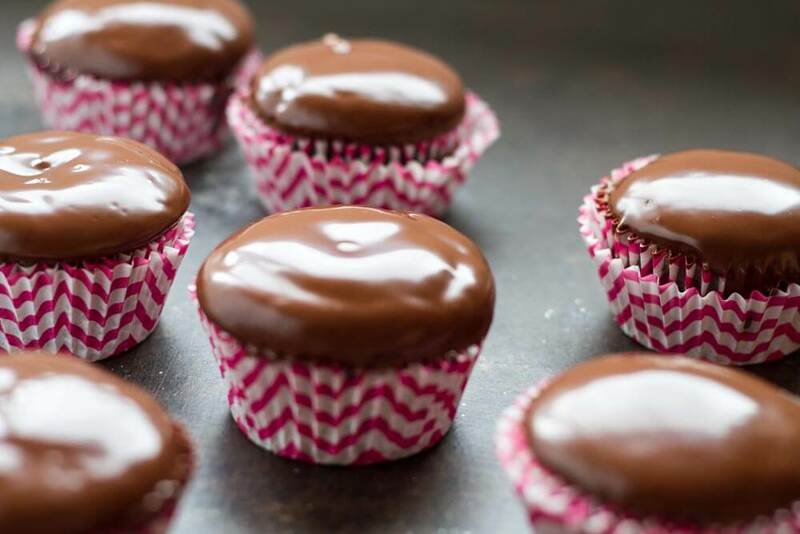 Dip each cooled cupcake into glaze, allowing excess to drip off. Allow to set for at least 30 minutes. **I use raw cacao powder for this recipe because of the nutritional value of it. You can definitely use unsweetened cocoa powder if that’s what you have. 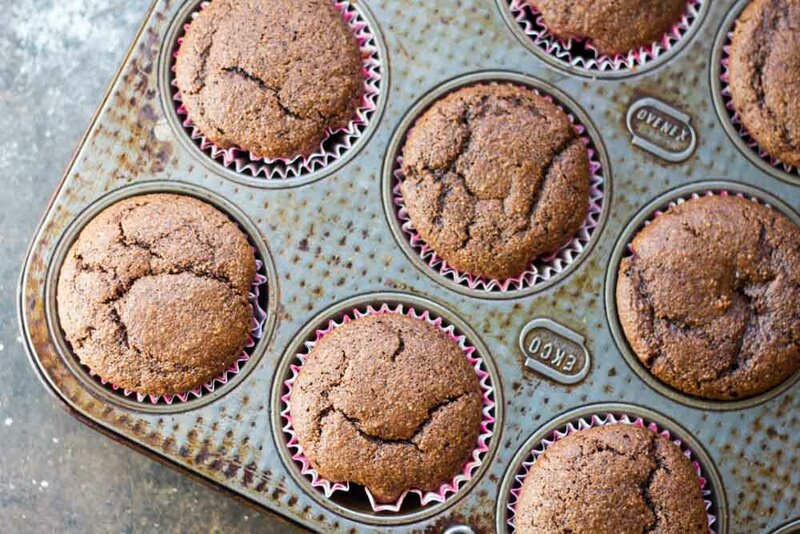 These cupcakes look so moist – I would never guess they are grain free! The perfect Valentine’s Day treat! Thanks, Cristina! The hard glaze made me very happy. And it’s so delicious too! Hi, these look delicious! I’d love to try this, but I’m allergic to tree nuts. Is there another flour I can substitute with? Hi! I love your recipes because I don’t eat flour. I live in Argentina and I’m wondering about replacements for some ingredients. For example arrowroot powder… can you replace it by corn starch? And what would you replace maply syrup by? We don’t use it here. The glaze looks so smooth, creamy, and rich. I love this chocolate cupcake recipe. Thanks for sharing !! That crackle on the top of those cupcakes – wow! They definitely look bakery-made and not gluten-free. 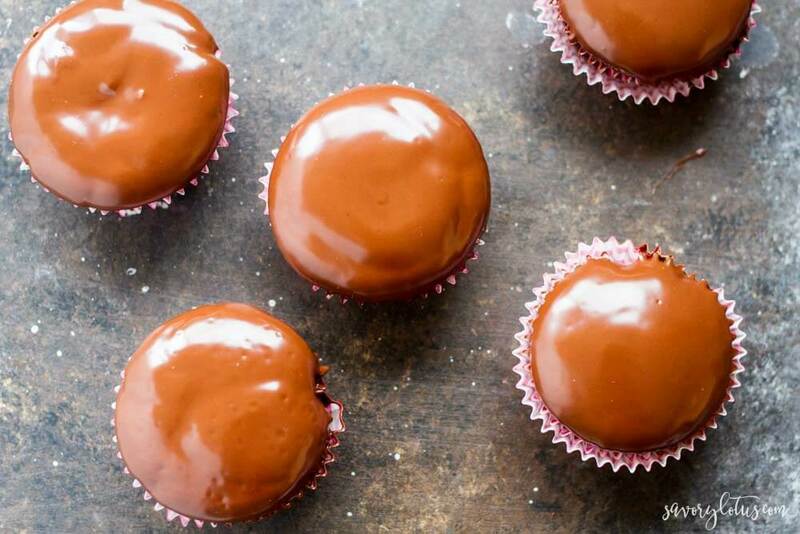 I love chocolate cupcakes (i mean, who doesn’t) so will have to try these! Ha! Thanks so much! Yes, the crackle is beautiful. Hope you enjoy them! 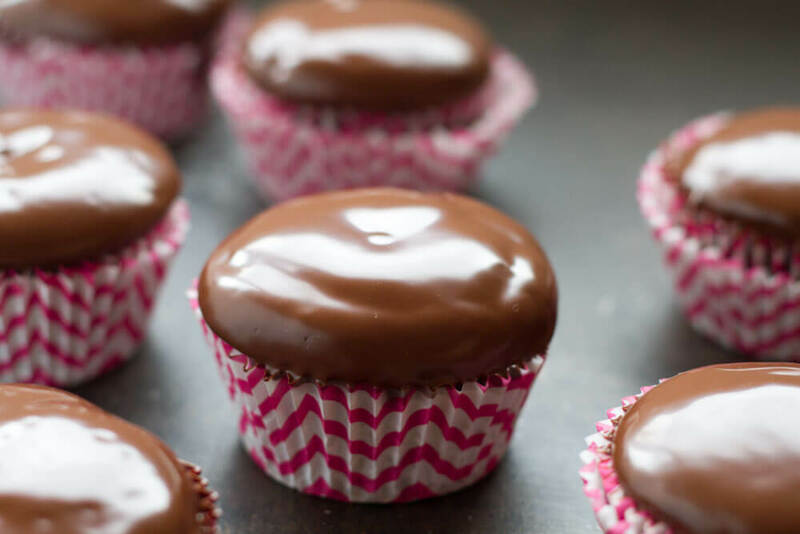 These cupcakes look perfect, and love that chocolate glaze! I have to watch sugar, so I will use Lily’s chocolate chips. We’re going to try these sugar free for our daughter’s birthday this weekend so we’re also going to use Lilly’s chocolate chips, but I’m making the batter sugar free as well with gentle sweet (a blend of xylitol, erythitol, and stevia that tastes like sugar). Do you think I should add a bit more moisture since I’m using a dry sweetener instead of maple syrup? What is the batter consistency like so I can tell? I’m making these into some deluxe cupcakes with sugar free swiss meringue buttercream so they’ll be extra decadent and should hide any cupcake base problems, but I still want them to be good! Yay! So glad that you like the flatbread! We love it too. 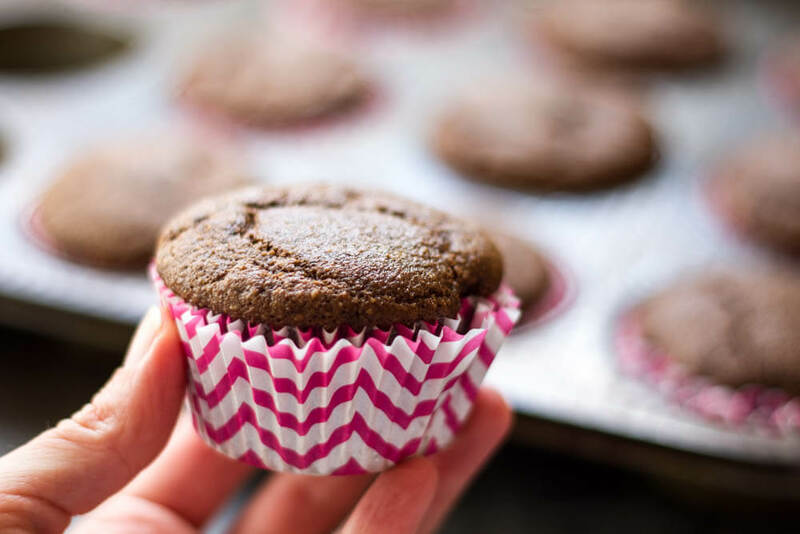 As for the cupcakes, you will have to play with the recipe as part of the texture comes from the moist sweetener. The batter will be dry if you don’t add something for moisture. The batter is like a typical cake batter- not too runny but def not dry. Let me know how it goes. The swiss meringue buttercream sounds divine! We did these sugar free with xylitol, erthyitol, and stevia. I added a little more liquid to counter the lack of maple syrup. They turned out fabulous. Just like a box mix of the crappy but yummy kind. I made a sugar free swiss meringue buttercream with it and they were perfect. Thanks so much! The best chocolate cupcakes indeed, these look incredible! 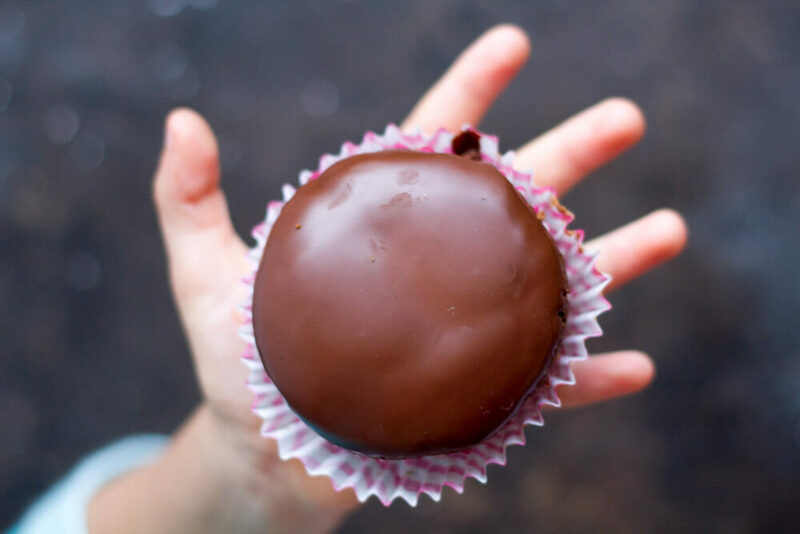 So fudgy and that frosting… I love how glossy it is! That frosting is gorgeous!!! 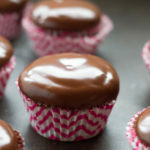 I have to make Valentine’s cupcakes for my daughter’s class; I’ll definitely try these! Omg the glaze looks so smooth and delicious! 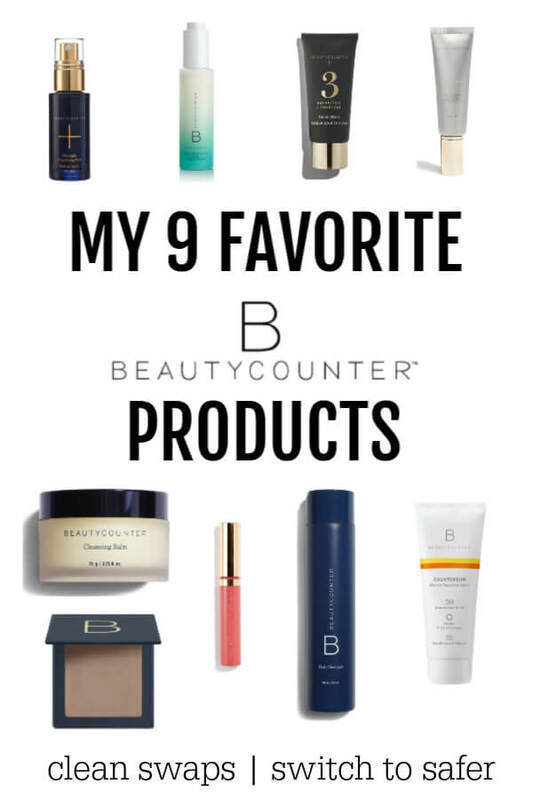 You really got it so perfect – they look amazing! Thanks! The glaze is so easy. Only 2 ingredients. It’s pretty fool-proof! I love those beautiful, glossy tops! 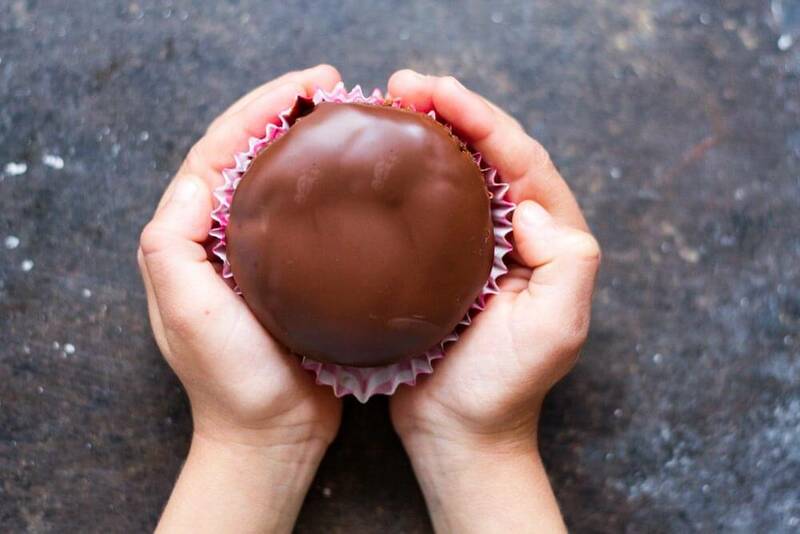 Looks like a cupcake to remember. 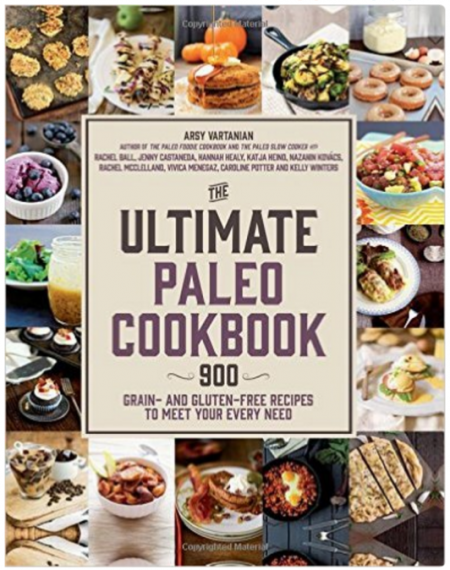 You know it’s a great recipe when people don’t know it’s paleo, shhh don’t tell them! I’ll have to practise the lettering, it looks so lovely. Right??!! Never tell. I have to practice my lettering too. I’m not that good with my pastry bag yet. The perfect Valentines day treat! These truly do look perfect! The inside looks moist and fluffy and that glaze is making me wish I had one right now! Yum! They are so moist and fluffy! I’m in love! These look so good! And that chocolate glaze! My kids would love these cupcakes! My kids love love these! The glaze is the bomb! Yum! This glaze looks heavenly! These look incredible! I can’t wait to try them. Thanks! I hope you get to try them. Wow, these look so chocolaty and heavenly! Me, too!! I’m always trying to get my Little One to help me with my shots. It’s so endearing to see her little hands. HA! Totally! Glossy tops are the best! Am I the only person who do not like taste of coconut/almond flour? It is so unpleasant taste in the mouth when I eat smthing made from it… That’s why I do not bake at all (I am Paleo also). We all have different tastes. I do not LOVE coconut flour on it’s own. That is why I combine flours to get the texture and flavor I like. Could you use this batter to make a 8 inch or 9 inch circular cake pan ? If so any idea on the cooking time ? This recipe sounds delicious but I need to make a cake ! Hi, Natalie! I haven’t made a cake with this batter yet. But I bet it would be great. I would just check it after 20 minutes and keep checking until it’s done. Please let me know if you try it. Never had a paleo recipe rise so high! Did add 1/8 t baking powder. Tried to post a picture but couldn’t figure it out. Absolutely delicious recipe! I baked for my twins birthday ring at school and you can’t tell the difference! Is it possible to freeze these cupcakes for future use? Many thanks! Do you think it would work if I used coconut sugar instead of maple syrup?